As a writer, I spend a great deal of time researching various topics. For my novel, UNLOCKED, which will be published 10/01/16 by Merit Press, I extensively researched hypnosis. Feel free to join the conversation in the comments, because I find this topic highly fascinating! These definitions seem pretty tame, but I’d like to suggest that not all hypnosis is safe. Actually, let me be perfectly clear: I am not an advocate for hypnosis. I believe not all hypnosis is safe for two reasons: 1) the vulnerability of the participant and 2) the ethical code of the hypnotist. 1. Have you had a positive experience with hypnosis? 2. Have you ever been hypnotized for entertainment purposes? 3. Have you ever participated in hypnotherapy? 4. Have you had any degree of negative experience with hypnosis? While it is possible to have a positive experience with hypnosis, I encourage caution, because not all hypnosis is safe. First, let me address the vulnerability of the participant. Typically, in order to be hypnotized, the participant must be willing. However, sometimes, he or she is overly willing and eager to escape the realities of life. Wanting to detach from the real world can become dangerous. Depending upon the vulnerability of the participant, a wide range of negative reactions is possible, everything from a headache to psychosis. 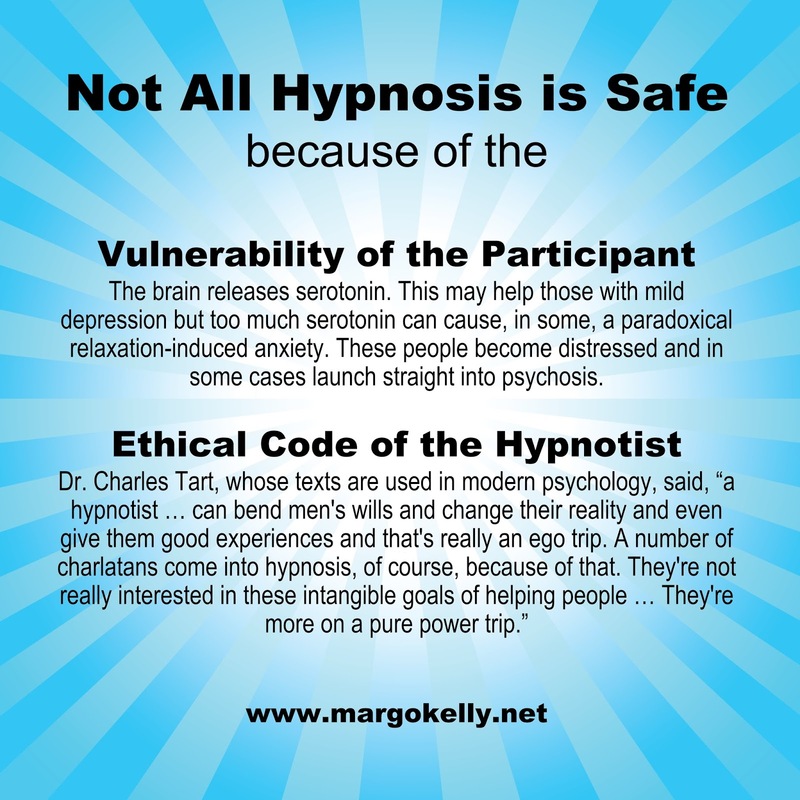 Second, not all hypnosis is safe because of the ethical code of the hypnotist involved. When I was in college, I had the opportunity to attend a hypnotism show. In an auditorium along with a couple hundred other students, we watched as approximately fifteen students went on stage and very willingly participated in the hypnosis. We all laughed and enjoyed the show as the hypnotized students on stage did silly things such as quacking like a duck or singing a song. It was great. Terrific. Until the end. While the participants were still hypnotized, the hypnotist turned to the audience and spouted his political views. Then he actually instructed everyone how to vote in the upcoming election. I was shocked. I was not hypnotized, and I was not in a suggestive state, but all of those students still on stage were under hypnosis, and I’m certain there were plenty of other students sitting in the audience who were in some stage of suggestibility from watching the hypnosis being performed. That’s the exact moment when I decided I did not like hypnosis, and I would never be hypnotized. Now, you might be thinking: that’s merely an anecdote and an isolated incident. Maybe. However, in my research, I found many of these types of stories. That was said by a man who is considered an expert in the field, whose publications are used in modern psychology. So where does that leave us? Am I telling you to never participate in hypnosis because it’s evil? No. That’s not what I’m saying. I am simply asking you to be cautious when considering hypnosis. First, be honest about your own vulnerabilities. Why do you want to be hypnotized? Are you bored and simply looking for entertainment? Are you trying to escape your own personal reality? Are you looking for answers that can be found via other avenues? Second, if you choose to participate in hypnosis, please take the time to research the ethical code of the hypnotist you plan to use. Join the conversation in the comments. What are your viewpoints on hypnosis? Have you ever been hypnotized? * While this article written by Mary Garden for The Humanist is about meditation, there are significant parallels between meditation and hypnosis, which I will present in a subsequent post. It was always my impression that once the hypnotized people "woke up" the hold was gone. For example, if during the hypnosis the people were conditioned to quack like a duck whenever somebody said "Hello" those people obviously don't continue quacking like a duck long after the show every time they hear "Hello." Right? So by that logic even if the hypnotist at the show you attended did talk about his political views, there's no reason to necessarily think those opinions stuck once the people were no longer hypnotized. That being said, it would certainly have been interesting to know if any of those people voted differently after the show than they did beforehand. As for the seduction stuff... that's just plain creepy. But it also makes sense. People get into all sorts of professions for the wrong reasons all the time, so it's no surprise that it would happen with hypnotists. I've never been hypnotized, and I don't think I'd ever volunteer for it at a show. Mostly because I hate being the center of attention even when I'm in complete control of my own actions... let alone being at the mercy of someone else. I have never been hypnotized nor do I have any desire to be hypnotized. This is partially because I like to be in control and the things the hypnotists generally make people do at the shows are silly and I don't particularly want to be made to look silly. And partially because I do think the hypnotist can plant suggestions or ideas that will remain in your subconscious without you being aware that they have been put there.